Looking for a twist on a traditional holiday dessert? As you know, the art of pastry design has achieved a new level of interest because of popular television shows like Cake Boss and Ace of Cakes. Philadelphia’s own Night Kitchen Bakery is experiencing a spike in business because viewers have become aware of the endless artistic possibilities. This awareness has created new challenges for Night Kitchen Bakery, maintaining traditions on the one hand and seeking new flavors and textures on the other. Every year between Thanksgiving and New Year’s Day, Amy Edelman’s Bakery is busy filling orders around the clock for one of the bakery’s most popular items. The Yule log, also known as the Buche de Noel, is a traditional French holiday dessert. 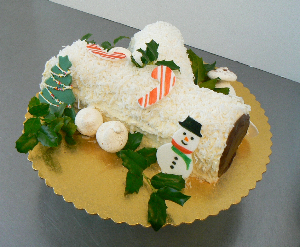 Traditionally created with a luscious home made whipped cream, rolled, iced with chocolate and decorated with fresh holly and candy canes, this year Edelman has fashioned a unique yule log flavored with orange and sprinkled with coconut. Miam! Edelman’s hands, as precise as a professional clockmaker, meticulously craft this holiday confection to perfection. We would like you to consider featuring Night Kitchen Bakery’s yule log in your holiday publication. We can either have one hand delivered to you or you can come to Chestnut Hill to meet the bakers and tour Night Kitchen’s intimate laboratory of confectionary delights. Night Kitchen Bakery is located at 7725 Germantown Avenue. Orders must be placed 48 hours in advance. Check out the website at Nightkitchenbakery.com. The holiday season is almost upon us, and there is no better way to get into the Christmas spirit than with a family trip to Linvilla Orchards. Hop on one of Linvilla’s old-fashioned hayrides through their 300-acre winter wonderland, overflowing with beautiful Douglas and Canaan Firs. Create a holiday family memory once you have found the perfect tree by easily cutting it down yourself with a provided saw. Linvilla’s helpful staff will then haul the tree back for you and mechanically shake and wrap it before they secure it to your car for the journey home. When you’re all finished, warm up by the bonfire where your family can roast marshmallows. Be sure to stop by the Farm Market for some tasty holiday treats. Take home a delicious fresh baked pie or warm up with some hot mulled cider. The brand new 15,000 square foot Christmas Shop and Garden Center is open, offering a wide variety of holiday collectibles and decorations, including greens, holly, wreaths, poinsettias, fruit filled gift baskets, Christmas gifts, and children’s crafts. Santa Claus visits every weekend in December for photos with the kids from 12 p.m. – 3 p.m. Bring your camera to capture all of the fun. 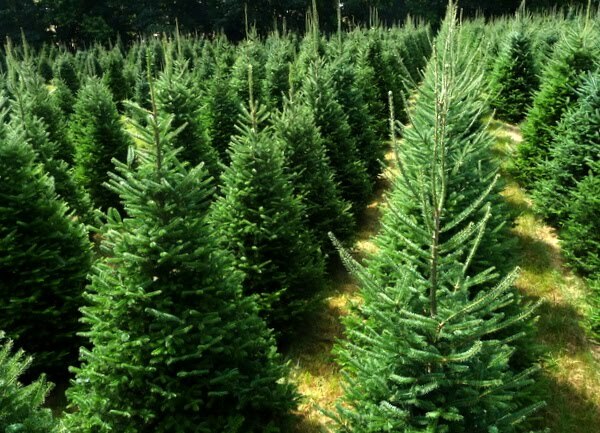 So that every customer can find the perfect tree for their family, Linvilla also has thousands of pre-cut trees available with prices starting at just $20. Whether you’re starting a new family tradition or continuing one, head over to Linvilla Orchards to cut your own Christmas tree. All cut-your-own trees are $59.99. Linvilla Orchards is a 300-acre family farm dedicated to agriculture, education and entertainment. To learn more, visit www.linvilla.com or call 610-876-7116. Linvilla Orchards, 137 West Knowlton Road, Media, PA. November 25-December 23, Monday-Friday 10 a.m. – 5 p.m., Saturday & Sunday 9 a.m. – 5 p.m.